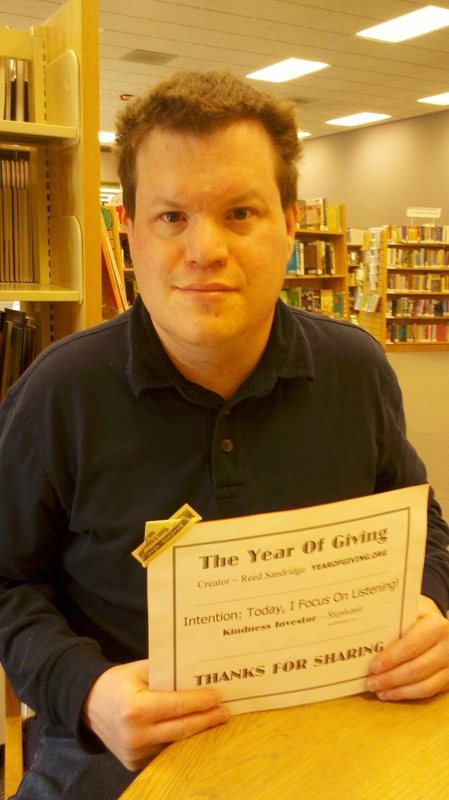 Today I gave my $10 to the students at the Buddhism Association School. The Buddhist monks here offer free English classes to adults. Tourism is a growing industry in Cambodia and the ability to speak English greatly enhances ones abilities to work, grow their income and improve their lives. While having the opportunity to be a substitute English teacher, I gave the students a donation which they used for school supplies (paper, pencils, pens, etc.) to aid them in their efforts. Tomorrow I’m visiting an orphanage! Day 169 – Giovanni B. Just two days until the Worldwide Day of Giving! If anyone is located in an area affected by the oil spill or knows someone who is, please drop me a note. Today’s recipient has a very special treat for you so I hope that you have a way to watch the videos that are posted on here. While I was in Manizales, I met Giovanni, a 31-year-old talented musician. Although born in the nation’s capital of Bogotá, he originally came to Manizales to play the bass for the city’s orchestra. 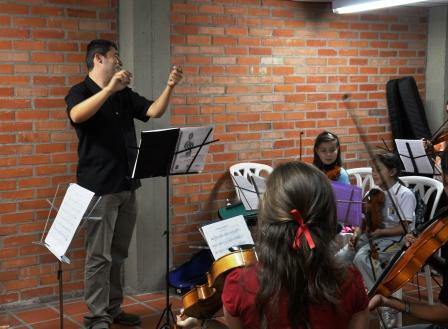 He continues to perform in Manizales and cities throughout the region in addition to teaching music at the renown Batuta National Institute; a national system of youth orchestras that aims to foster social development through music. He says he really likes life in Manizales. I got a rather first hand view of his life as I was Giovanni’s neighbor for the 12 days I spent in Manizales. He was living in the area of Guacas where Roberto Gonzalo lives and has his coffee plantation. To go to work, he regularly makes the exhausting 30 minute walk up the mountain to grab a bus that goes down into the city. It’s at least an hour or more to get into the city. I know that because I did that several times while I was there! Giovanni invited me into his home. It’s simply decorated with the essentials. I can not help but notice the large bass leaning against the wall. I was hoping he would play it for me. We speak a mixture of Spanish and English. He is very comfortable talking to me and even starts to prepare some dinner. Dressed in a t-shirt, pants, flip-flops, he moves around his kitchen. I asked him what he was cooking. “I am kind of inventing right now.” I tend to do the same thing. Before I know it he had made some coffee and served me a cup. He says that he personally likes jazz, symphonies, and chamber music. With a music degree from the Technological University of Pereira, he has a solid appreciation of many music genres. If Pereira sounds familiar to you, it’s probably because that is the airport where I arrived. Giovanni added that it is also where his parents live. Since I have been here during the election period, I also asked Giovanni who he felt would be the best leader to continue Colombia’s positive development that it has experienced over the past several years. He gave me that slightly uncomfortable look that many people do when you move the conversation to political views. He says that he has the most faith in Antanas Mockus from the Green Party. “But I think Juan Manuel will win,” he says referring to Juan Manuel Santos who leads the poles. Like Viviana from Day 164, he opted to receive $10 instead of 20,000 pesos and also said he planned to keep the money as a memory of this experience. That is touching that he would want to keep it to remember our meeting. I asked Giovanni if he would play for me and he obliged. Take a listen to this. It’s beautiful. Giovanni had some questions for me as well. When I told him that I grew up in Pennsylvania, he told me that he had been there and that he travelled there regularly to perform. His grin told me something was not as it appeared though as he divulged that he was referring to Pensilvania, another city in the state of Caldas. Somehow I think that William Penn had no idea that years later there would be a city in Colombia that would share the name of the US state that was named after the colonial leader.